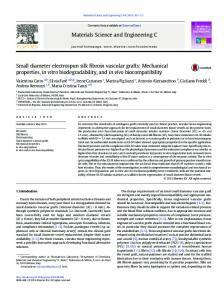 Jun 30, 2012 - Materials Science and Engineering, C, 30, 631-635. doi:10.1016/j.msec.2010.02.019. Thein-Han, W.W., Saikhun, J., Pholpramoo, C., Misra,. Mar 21, 2016 - Department of Mechanical and Industrial Engineering, College of Engineering, ... dispersions and the mechanical properties [9â11] of WPU films are of ...... matrix as groups with an average size of ca 480 Ë 670 nm2, and the. 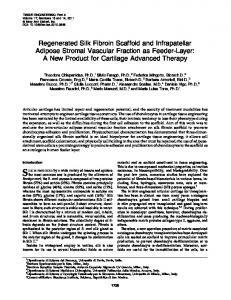 Apr 22, 2014 - Another key obstruction for long-term successful implant integration is ... 66%). 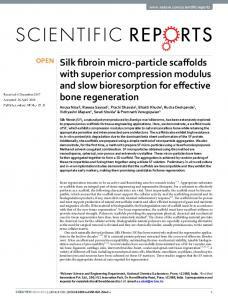 Dissolution of the silk fiber in LiBr solution gives almost 100% yield of .... Semi-quantitative RT-PCR of osteoblast differentiation gene markers. 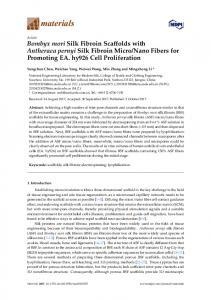 Jan 29, 2013 - These new porous SF microspheres hold a great potential for cell culture carriers ... chitosan, hyaluronic acid, alginate, dextran and starch, as. FTIR Studies Fourier Transform infrared (FTIR) spectral analyses of chitosan / silk fibroin composites were performed with Thermo Nicolet AVATAR 330 spectrophotometer in 4000 – 400cm-1 wave number range, using KBr pellet method. X – Ray Diffraction Studies X–ray diffraction (XRD) patterns of chitosan / silk fibroin composites were studied using X-ray powder diffractometer (XRD – SHIMADZU XD – D1) using a Ni – filtered Cu Kα X–ray radiation source. The relative intensities were recorded within the range of 100 – 900 (2θ) at a scanning rate of 50min-1. Thermo Gravimetric Analysis Thermogravimetric analysis was conducted to measure the thermal weight loss of the chitosan / silk composites on a SDT Q600 V8.0 Build 95 instrument at a heating rate of 100C per minute in nitrogen atmosphere. The weight losses at different stages were analysed. 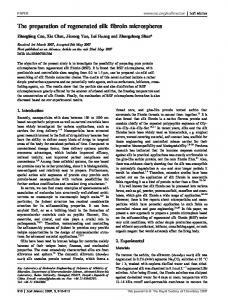 P. N. Sudha et al Der Pharmacia Lettre, 2013, 5 (4):88-97 ______________________________________________________________________________ Differential Scanning Calorimetry The differential scanning calorimeter (DSC) was used to examine the thermal property of the chitosan / silk fibroin composites. The measurements were performed with NETZSCH DSC 200 PC in a pan Al, pierced lid in the N2 atmosphere at a heating rate of 100 K /min. The results were recorded and analysed. Scanning Electron Microscopy (SEM) The surface morphology and cross sectional morphology of the chitosan / silk fibroin composites were observed with scanning electron microscopy to verify the compatibility of the mixtures of chitosan and silk. For the analysis, the samples were cut into pieces of various sizes and wiped with a thin gold – palladium layer by a sputter coater unit (VG – microtech, UCK field, UK) and the cross section topography was analysed with a Cambridge stereoscan 440 scanning electron microscope (SEM, Leica, Cambridge, UK). RESULTS AND DISCUSSION FT-IR spectorscopy FTIR spectroscopy is one of the most powerful techniques of investigation of multicomponent systems because; it provides information on the blend and composite composition and also polymer - polymer interactions . The following section describes the FT-IR spectral details of chitosan (Figure 1a) and CS/SF composites of 1:1, 1:2 and 2:1 (Figure 1b -1d) weight ratios in the presence of the cross linking agent formaldehyde. The IR spectra of chitosan (Figure –1a) showed a strong absorption band at 3454cm-1 due to OH and amine N-H symmetrical stretching vibrations. A peak at 2923cm-1 was due to symmetric -CH2 stretching vibration attributed to pyranose ring . A peak at 1156cm-1 was assigned to the structure of saccharide. The sharp peak at 1384 cm-1 was assigned to CH3 in amide group. The broad peak at 1021cm-1 and 1098cm-1 indicate the C-O stretching vibration in chitosan and peaks at 1628 and 1540cm-1 were due to -C=O stretching (amide I) and NH stretching (amide II). The absorption bands at 1151cm-1 (anti symmetric stretching of the C-O-C bridge) 1098 and 1021cm-1 (skeletal vibration involving the C-O stretching) are characteristics of chitosan polysaccharide structure. 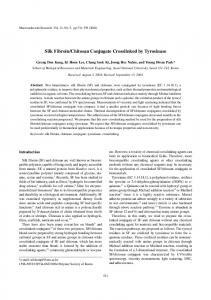 The spectral features of pure chitosan were in agreement with previous results . P. N. Sudha et al Der Pharmacia Lettre, 2013, 5 (4):88-97 ______________________________________________________________________________ represented the –C-H stretching of –CH2 group in formaldehyde used as crosslinking agent. The peak at 1023cm-1 indicated the C-O stretching vibration in chitosan. The successful coupling of chitosan to silk fibroin was confirmed by the amide I and II absorption bands, amine band as well as CH and glycosidic bands (C – O - C) of chitosan. The amine, residual amide and hydroxyl groups of chitosan can form the intermolecular hydrogen bonds with the ether and carbonyl groups in PEG and polylactide, respectively [10, 11]. Similar interaction was also expected between the chitosan and silk, which has large number of amide linkages. Existence of these intermolecular bonding were investigated from FTIR spectra which proves the formation of the stable composite of chitosan with silk fibers. It was observed that the absorption peak at about 3454cm-1 due to O-H and N-H stretching vibrations shifted to a lower wave number with the increase of chitosan in the composites. Moreover, on comparing with FTIR spectra of pure chitosan, with the absorption peaks of chitosan /silk composites, the peak at 1740cm-1 in chitosan disappeared in the composites showing the formation of hydrogen bonds between chitosan and silk fibroin. Formation of homogeneous chitosan / silk composites was a result of strong interactions by hydrogen bonds between functional groups of the composite components in which amino and amide groups of chitosan would have taken part. The FTIR spectra of the composites enable these interactions to be identical . Thermogravimetric Analysis Thermogravimetric analysis is an experimental technique which can give some information about the thermal behavior of the chitosan and its composites. Figures 2a - 2d show the thermogravimetric details representing the weight loss upon increase in temperature for pure CS and CS/SF, composites (1:1; 1:2; 2:1) - formaldehyde. 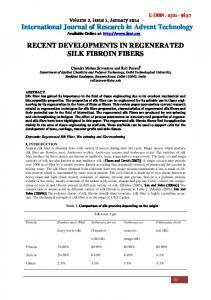 From Table–1 and Figure-3 it is evident that the percentage decomposition of chitosan/silk fibroin (1:1) was minimum upto 3000C which becomes equivalent to the decomposition rate of CS/SF (1:2 and 2:1) composites till 5000C. After 5000C the composites became stable and the rate of decomposition of CS/SF (1:1) decreased than other two composites namely CS/SF (1:2), CS/SF (2:1). Generally in polysaccharides, dehydration, depolymerization and pyrolytic decomposition of the backbone are involved at these high temperature ranges resulting in the formation of H2O, CO and CH4 and in the case of chitosan, NH3. In fact, the third stage has a maximum at 3000C with weight loss of 30% which represent the decomposition of the main chain with the production of H2O, CO and CO2 and some other fragments from the glucosaminic ring, (namely, 12 ([C]+), 16 ([O]+), 17 ([OH]+), 18 ([H2O]+) and 44 ([CO2]+). And the fourth one probably originated by the formation of a carbonaceous residue from the remaining degraded structures, with a maximum around 3700C . The thermogravimetric profiles follow a two-stage decomposition process for the composites. The main observation on these systems is that the decomposition of the composites took place at lower temperatures than those for the degradation of pure CS. This degradation is about 25% higher relative to the pure CS in the case of CS/SF composites. This is an unusual behavior because normally thermal stability increases for related systems [13, 14] and this anomaly could be related with crystalline and/or morphological variations in composites with respect to those of the pure polymers . 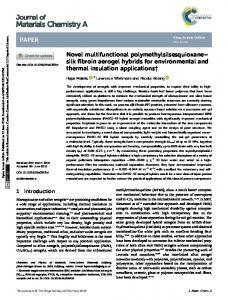 P. N. Sudha et al Der Pharmacia Lettre, 2013, 5 (4):88-97 ______________________________________________________________________________ DSC thermal analysis It is well known that the miscibility of the molecules in a polymer composites can be judged by the morphological methods and/or the properties of the solid state such as the glass transition temperature, the mechanical relaxation and so on. Glass transition temperature can be measured by various methods such as dilatometry, DSC or DTA, spectroscopy, diffraction, rheological, dielectric methods. Among them, the DSC method is one of the convenient ones . Observation of single Tg (Figure 4b - 4d) in all the composites proved the mixing of the two polymers. Also, it was confirmed that chitosan and SF were mixed well and consequently the molecules of the individual polymer cannot crystallize to result in an increase of the amorphous regions with mixed molecules. In other words, a miscible phase of the two polymers, which cannot crystallize, might be newly formed. X-RAY Diffraction studies X-Ray diffraction (XRD) can yield further information regarding the crystalline structure of the solid. Chitosan exhibits a fairly broad peak due to its amorphous structure at 2θ of 200. 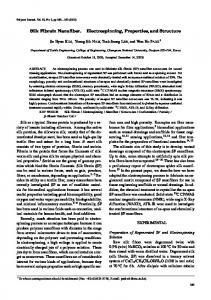 Studies have suggested that neutralization of chitosan by NaOH induces crystalline formations as evidenced by the creation of peaks at 2θ of 100 and 150 Ma et al.,  performed XRD measurements to characterize structural changes in the chitosan resulting from different degrees of chitin deacetylation. X-ray diffractogram of CS (Figure-5a) had a semi crystalline state with two main diffraction peaks at 100 and 200 present in the diffraction pattern. The weak diffraction peak centered at diffraction angle 2θ-100 and sharp diffraction peak at 200 are indicative of high degree of crystalline morphology of chitosan [18, 19]. The crystallographic peaks around 2θ-100, 200 are shifted to higher value 190 and 290 (Figures – 5b – 5d) conclude the strong interaction occurred between chitosan and silk molecules . The higher semi crystalline nature of the composite with higher amount of silk indicated by a broad amorphous peak indicating that there was a molecular miscibility and an interaction between the three components such as chitosan, silk and formaldehyde. 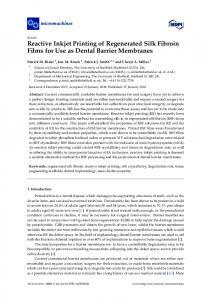 P. N. Sudha et al Der Pharmacia Lettre, 2013, 5 (4):88-97 ______________________________________________________________________________ Hence, it is suggested that the composite CS/SF (1:1) have increased amorphous nature, lower water vapour permeability, good mechanical proportion and improved gas barrier properties . Scanning Electron Microscopy The surface morphology of chitosan characterized by SEM indicated a microporous and fibrous structure. Crosslinking considerably modified chitosan morphology, and also its physical, chemical and biodegradable characteristics, which varied with respect to the nature of the synthetic side chains incorporated. SEM observations of CS/SF (1:1) – formaldehyde revealed almost smooth surface (Figure - 6) with reinforced fibers seen as projections coated with chitosan film on the surface. The expected interactions between silk fibers and chitosan matrix is hydrogen bonding which make the composite stable with many hydrophilic sites at the surface. The cross sectional morphology of the same composite (Figure - 7) showed the fine interaction of the silk fiber into the chitosan matrix. The broken fiber reveals the finer mixing of the fiber with the chitosan. The pores and microvoids are newly formed in the composite which is revealed in the cross sectional morphology. The pores are effective in increasing the functional surface in the composite which enabled the same to be used as a good adsorbent. P. N. Sudha et al Der Pharmacia Lettre, 2013, 5 (4):88-97 ______________________________________________________________________________ the chitosan /silk fibroin composites (1:1, 1:2, 2:1) in the presence of the cross linking agent formaldehyde were dipped in demonized water and the amount of water absorbed was measured at different intervals of time. From the above results, it was found that the percentage increase in weight were 73, 91, 102 and 170, 300, 380 for chitosan and CS/SF (1:1) composite during 4th, 8th and 12th hour respectively. When compared to CS/SF (1:1) composite, the increase in weight of CS/SF 1:2 composite was less whereas, it was very high in the case of CS/SF (2:1) composite. This shows that the increase in chitosan content increases the degree of swelling of the composites. After 12 hours the rate of increase of swelling was observed minimum. The rate of increase was found to be the most in the case of CS/SF (2:1) and least for CS/SF (1:2) during the first 4 hrs showing the higher water uptake capacity of chitosan than silk fibroin (Figure - 8). There are several reasons to this phenomenon. One of the reasons could be attributed to the formation of intra hydrogen bonding and inter hydrogen bonding in CS/SF composites restricts the moisture absorption by SF fibers and consequently reduces the water uptake by the composites. 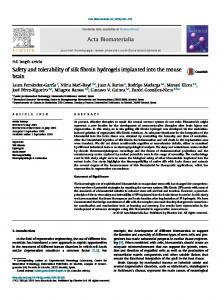 Hence, a relatively more hydrophobic chitosan film was produced with addition of silk fiber. Also addition of the crosslinking agent, formaldehyde may inhibit the swelling capacity of chitosan . In general, the rate of water absorption for silk reinforced chitosan composites could be conveniently divided into three main phases. Phase one is corresponding to the highest rate of water absorption occurring, during the first 8 hrs of immersion time. In this phase, the increasing rate of water absorption was observed with time. The second phase, where the rate of water absorption is slower than the first phase with decreasing rate, was observed with time until the equilibrium state is reached. Phase three is, where the rate of water absorption is zero and there is no longer water absorption occurring and the water content in the specimen becomes saturated . Swelling would cause a conformational change in the microstructure of the composite films and open up the polymer structure to allow an increase in permeate flux. Changes in the polymer structure that occur in response to stresses generated within the film during sorption are consequences of swelling . 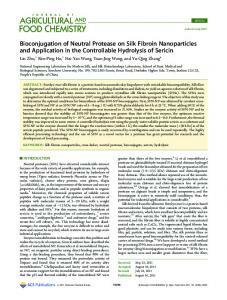 The degree of swelling of chitosan / silk fibroin composites is one of the important factors in determining the usefulness of the bio materials. The chitosan has excellent swelling process. 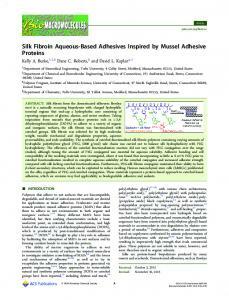 The degree of swelling of the chitosan/silk fibroin composite could be enhanced by the addition of chitosan component . CONCLUSION Chitosan an excellent bio polymer having wide range of application was used for the treatment of the tannery effluent by modifying its properties by way of fiber reinforced composite formation with silk. 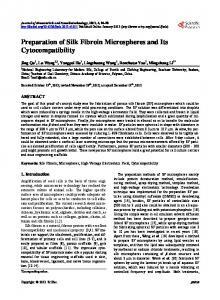 Chitosan/ silk fibroin composites of various compositions l:1, 1:2, 2:1 w/w were prepared using formaldehyde as crosslinking agent, by mixing the short silk fibers into chitosan gel. The characterization of the composites was carried out. Some of the characterization procedures include swelling index, FTIR, TGA, DSC, XRD and SEM analyses. From the above analyses, it was found that composites have been formed well with modified thermal and crystalline properties which will act as a good biosorbent for remediating tannery effluent. REFERENCES  W.F. Stevens, M.S. Rao and S. Chandrkrachang, Chitin and chitosan, Asian Institute of Technology Bangkok, Thailand, 1996. R.H. Chen, H.C. Chen, Advances in chitin science, National Taiwan Ocean University, Keelung, Taiwan, 1998. Cheng-Ho Chen, Fang-Yu Wang Chins-Fengmao, Wei-Tung Liao and Ching-Dong Hsieh, International journal of Biological macromolecules, 2008, 43. pp. 37-42. 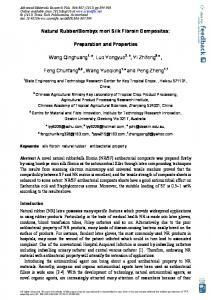 Song Wang., Qing-hua Wang., Xin-lin Yang., Li-yong Wang, He-sun Zhu, Chinese Journal of Polymer Science. 2003, 21 (1): pp. 87-91. R. A. A. Muzzarelli, Cell Mol, Life Sci. 1997, 53. pp. 131–140. S. Nara, T. Komiya, Starch-starke. 1983, 35. pp. 407–410. Y.M. Lee, S.H. Kim, S.J. Kim, Polymer, 1996, 37(26), pp. 5897. A. Pawlak, M. Mucha, Thermochimica Acta, 2003, 396. pp. 153 – 166. Y.X. Xu, K.M. Kim, M.A. Hanna, D. Nag, Industrial crops and products, 2005, 21, pp. 185-192. 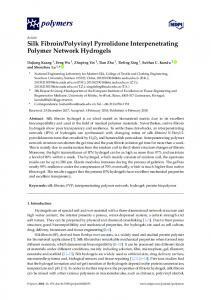 Han Zhang., Jun Nagoshi., Mary Becker Jie Yuchen, Ryujimatsunaga, Journal of Applied polymer science, 2002, 86. pp. 1817–1820. P. N. Sudha et al Der Pharmacia Lettre, 2013, 5 (4):88-97 ______________________________________________________________________________  W. B. Chen, L. F. Wang, J. S. Chen, Journal of Biomedical Materials Research , 2005, 75A, pp. 128-137. Z. Zong, Y. Kimura, M. Takahashi, H. Yamane, Polymer, 2000, 41(3), pp. 899–906. D. R. Paul, J.W. Barlow, H. Keskkula, (1989). H. F. Mark, N. M. Bikales, C. G. Overberger, and G.Menges (Eds. ), Encyclopedia of polymer science and engineering. New York: Wiley. P. Sandford, A. G. Skjak-Braek, T. Anthonsen, P. A. Sandford, (1990). Chitin/chitosan: Sources, chemistry, biochemistry, physical properties, and applications. Amsterdam: Elsevier. M. T. Viciosa, M. Dionísio. 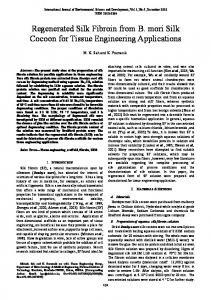 Journal of Non-Crystalline Solids, 2004, 341 (1-3)1, pp. 60-67. LA. Utracki, Munich/FRG, 1989, 111–126. G.H. Ma, Z.G. Su, S. Omi, Encyclopedia of Surface and Colloid Science, in: A. Hubbard (Ed. ), Marcel Dekker, New York, 2006, 5726. K. Ogawa, T. Yui, K. Okuyama, International Journal of Biological Macromolecules, 2004, 34, pp.1–8. Santhosh Kumar, Joydep Dutta, P.K. 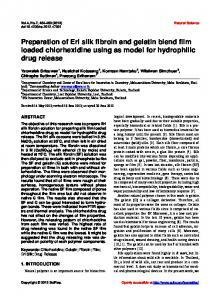 Dutta, International journal of Biological macromolecules, 2009, 45, 330337. 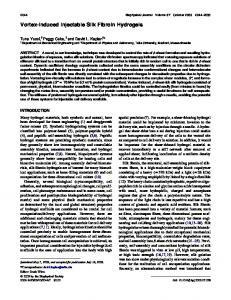 Yong-Tang Jia., Jian Gong, Xiao-Hua Gu, Hark-Yong Kim, Jong Dong and Xin-Yuanshen, Carbohydrate polymers, 2007, 67, 403-409. Q.P. Zhang, W.S. Xia, Food.Technol. Biotechnol. 2008, 46(3), 262-269. G. Bagher Marandi, Esfandiar, M. Biranvand, S. Babapour, G.R. Sadeh, J. Applied polymer. 2008, 109 (2), pp. 1083–1092. Nurhidayatullaili MuhdJulkapli, Hazizan Md Akil, Materials Science and Engineering C, 2008, 49, 1100–1111. M. F. Cervera, J. Heinämäki, K. Krogars, A. C. Jörgensen, M. Karjalainen, A. I. Colarte, AAPS PharmSciTech, 2004, 5, 1–6. Hae Yong Kweon, Hyun Chul Ha, In Chul Um Young Hwan Park, Journal of applied polymer science, 2001, 80, 928–934. 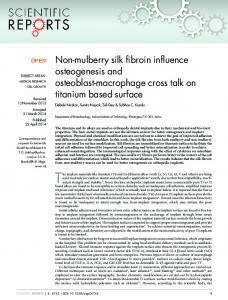 Report "Chitosan and silk fibroin"